I didn't know about Cycle Font Color, until I found it recently. I'm building an Excel workbook that has macros, and a custom Ribbon tab, with buttons to run those macros. One of the macros creates a list of 56 colours, so I looked for a built-in Excel command that has a colourful image. After installing the gallery, open Excel and click the Developer tab. A new group appears at the right end of the tab, with 9 galleries. Point to any icon, to see its name. You can use that name when setting up your custom Ribbon tab. Instead of using one of the icons gallery add-ins, I used Excel's build-in button image list. The image name is at the end, in brackets. In the Customize the Ribbon window, the default list is Popular Commands. To find something a bit different, I chose the list of "Commands Not in the Ribbon". After scrolling down a bit, I spotted the type of colourful image that I wanted – Cycle Font Colors. I jotted down its image name – FontColorCycle – to use in my custom Ribbon tab. I didn't know what that command does, so I wanted to try it. The Cycle Font Colors command isn't on the Excel Ribbon, but you can add it to your Quick Access Toolbar, or to your Ribbon. So, I made a new group on the Home tab, and added the command, to see what it does. Each time you click on the Cycle Font Color button, it adds 1 to the Color Index number for the font colour in the active cell. The count starts at the current Index number, and goes up to 56. Then, it starts at 1 again. In the screen shot below, the text started as Black (color index 1). The first click changed the color index number to 2 (White), and the next click changed the font to Red. To see the colours a little better, you could use the Wingdings font, with a lower case "n". It's entertaining to use the Cycle Font Color button, but I can't think of any real-life uses for it. Can you think of anything? Maybe Cycle Font Color was helpful in the old days, when we had to find our way into Tools | Options | Color, to adjust the settings. Clicking a button would be a lot quicker than that! 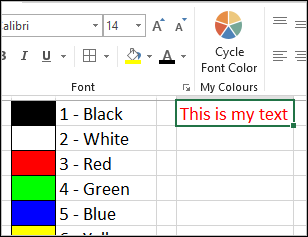 Also, did you know that Excel recognizes the first 8 colours by name too? You can use those names in custom number formatting, to change the font colour based on conditions. In this screen shot, the numbers >=50 are red, and anything less than 50 is green. For more colour resources, go to my Colours blog post from earlier this year. You'll find a links to John Marshall's Color Lists Workbook, Jon Peltier's article on Excel colors, chart colour macros, and other colour references. I have had these two macros on my QAT for a few years, the first cycles through the 5 font colours I use most often, Blue for input cells, the others for various highlights. The second cycles through 5 cell shading (fill) colours. Together they make formatting on the fly quick, easy, and consistent from workbook to workbook.